But what McNealy understood was that it wasn’t in the DNA of enterprise IT vendors like Oracle and Sun to market low-cost computers for school kids. The Network Computer needed to be a thin client for corporate networks. Two years later, in September 1999, Sun introduced its Sun Ray thin client. And that’s what will fulfill Ellison’s hardware dream. Sun’s server business does absolutely nothing for Oracle. Unix servers are a dying breed, and Intel/AMD-based servers are a commodity. Oracle will almost certainly ratchet that business down as quickly as possible, or sell it off outright, perhaps to Fujitsu. But the thin-client business is a different story. It’s not difficult to see that the future of corporate computing lies in the cloud, and that a thin-client architecture will seed it. My main concern is zfs. But if Oracle decides to delivery application appliances with Solaris/x64 hardware, I suspect future Solaris development should be fine. Clever tip for using vim on zipped files. ie Openxml or ODF. I haven’t found a conclusive solution, but the either restart postfix or adjusting the MTU on the mail server interface may fix the problem. Note this changes the password to “password”. 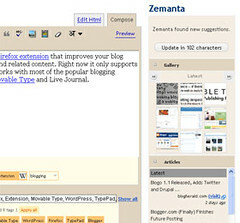 I’ve just installed Zemanta, a blogging tool which suggests pictures and links to enrich blog entries. It bases it’s suggestions on the written content with comparisons to similar content published by other sites and bloggers. Actually seems to be quite clever. I’My posting rate is not very high at the moment as I’m busy with a lot of business projects, but when I do this will be useful.